The XTx-400 X-Band Transmitter supports very high-speed payload data downlinks for Earth observation and scientific missions. The XTx400 is based around a Xilinx Virtex-5 FPGA (field programmable gate array) and is highly flexible, supporting a number of different data rates, modulation, and coding schemes. A maximum data rate of 500 Mbps can be supported with 8PSK modulation and 5/6 TCM encoding. 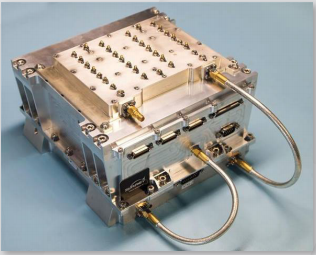 Utilizing Surrey’s X-Band Antenna Pointing Mechanism, it is feasible to operate two transmitters simultaneously in opposite polarizations, delivering a total downlink data rate of 1 Gbps. The XTx400 evolved from Surrey’s heritage XTx105 X-Band Transmitter, which has flown on over ten missions including, most recently, NigeriaSat-2. The new transmitter is flying for the first time as a complete unit on Surrey’s TechDemoSat-1 mission, launched in 2014.